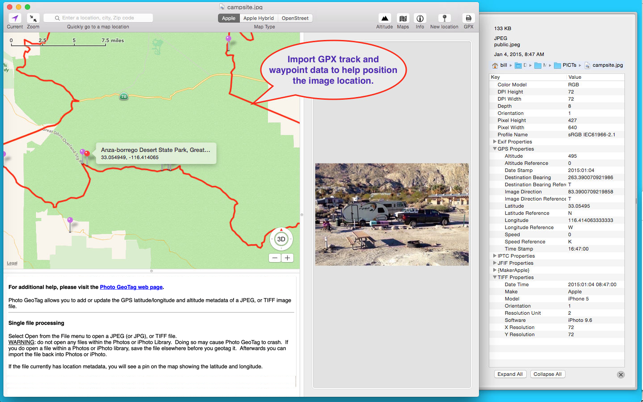 This tool does what it says: adds geographic info to your photos. You can do them one at a time, or in batch mode. 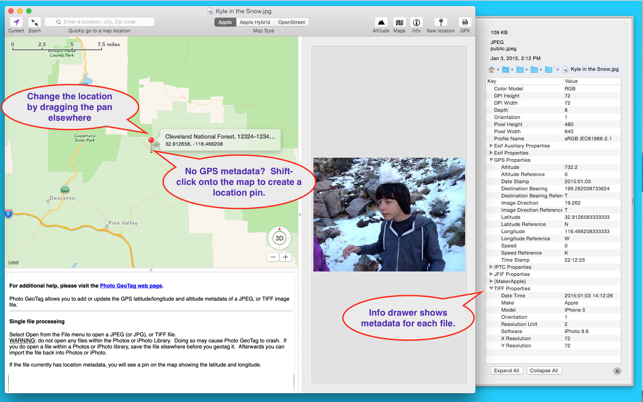 Searching for a location is super-easy, and it looks like the tool can use alternate map sources, other than the standard Apple Maps. I found a slight problem with the displayed time for photos take in another timezone, and the developer had it patched in a couple days. Couldn’t ask for better support! The app is basically OK in that you can geotag a photo. It is not as easy nor as efficient as it ought to be. I hike and mountain bike with my camera and the hike/bike trails in our state parks are not in the App’s map. That means that for off-road photos, you will always be guessing to some extent. When I add GPS data to one picture, in general the next picture will be close to the previous one, but this app doesn’t assume that. It backs its view out a few thousand miles so that you have to zoom in to the same location for picture after picture. Possibly I can work around this. For a low-priced app that does its most basic job, it is OK. A couple of small improvements could make it better. Being one of those quaint old-fashioned people who still takes photos with a “regular” camera, my photos don’t have location information embedded in them. This has proven to be a good tool for correcting that issues so that photos taken in the same location — whether on the iPhone or my camera — can be easily grouped together. I made a suggestion to the developer on another site and he quickly responded and added the suggested feature, which I appreciated.